A comprehensive range of attenuators has been developed to cater to the diverse constructional and performance specifications required in the mechanical services industry. The attenuator acoustic design is governed by various parameters such as source noise levels, system losses, distances, noise criteria, etc. Understanding the importance of assessing the most economic unit to meet the proper noise criteria, we also consider the practicalities of the ductwork system. In order to optimise the design, Sound Planning uses HVAC software to analyse the system requirements and plan the appropriate attenuators. Due to the diverse range of projects undertaken, attenuator construction also includes a wide range of options that can fully cater to various specifications. The circular silencer range is typically used in ductwork systems, where it can be duct mounted or bolted directly onto the fan – if size allows. Depending on the acoustic requirements, circular attenuators can incorporate a central ‘pod’ that can increase the acoustic performance in terms of insertion loss – attenuators without a pod can only offer acoustic performance at minimal resistance to airflow. Cross-talk attenuators are selected using our calculation software – to help determine the necessary insertion losses, whilst maintaining low system pressure drops (a pre-requisite at this point in the system). This range can either be of rectangular or circular construction. For this technology to be used by consulting engineers and contractors, a noise control engineer should attend your offices and go through the project requirements. Based on the information obtained, our team of experts will initially discuss the findings through a comprehensive and detailed report – which includes the right attenuator selections for your requests. 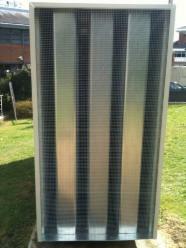 For attenuator enquiries please call 01252 711972 or email us at enquiries@soundplanning.co.uk.